Sized to work in larger diameter tubes, This dent barrel has a more pronounced profile for raising stubborn dents. Great for the bottom end of Tenor and Baritone saxes and saxophone bell sections. Machined with smooth radius edges from rust-resistant magnetic stainless steel. Sized to work in larger diameter tubes, This dent barrel has a more pronounced profile for raising stubborn dents. Great for the bottom end of Tenor and Baritone saxes and saxophone bell sections. Machined with smooth radius edges from rust-resistant magnetic stainless steel. 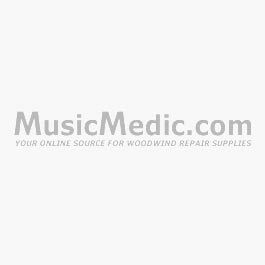 1/2-13 threads are compatible with many other dent removal tools and is a great match with our other sax dent barrels and dent rods. The significant weight of this dent barrel 'packs quite a punch' when using with a rebound dent removal method. Great for reshaping damaged guard feet or bell guards too!